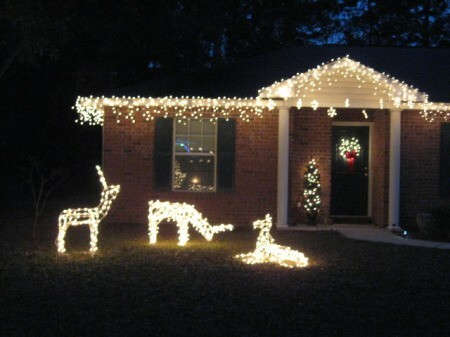 If you have lights on your wire lawn deer that stop working, don't toss the deer in the garbage, just change out the lights. Take a strand of 100 white wire lights and replace the old lights. It's time consuming putting all new lights on, but it's a lot less $ than going out and buying all new deer, and it's a good way to recycle also. I didn't think of this till I had given one of mine away. I was so disheartened as I love the lit deer and had finally gotten a pair, then one wouldn't work anymore and I got rid of it. When the second one went and I couldn't find them in the store anymore (the size I wanted) my husband finally said why don't you just change the lights. duh! It was so easy using a string of white lights (with white wire) and white zip clap ties. Wouldn't it be nice if these company's made these replacement bulbs in LED, so we wouldn't have to restring the deer every 3 years and could link to line on bushes?